When working with new teams it should be assumed that participants have little or no experience with project management and task delegation within a team environment. A brief introduction to agile and scrum systems is beneficial. Each of the new teams takes time to familiarise themselves with their final concept and the brief to which it must fulfil. A detailed work plan is developed, breaking down every element that can be identified: timescales for delivery, priorities and dependencies. These project lists and their assignment need to be agreed by the team before being put into action. Facilitators need to oversee this process to ensure that the aims are realistic and can be achieved within the scope of the programme. After note: Fiver years on. One of the difficulties in moving this model of work into a degree type programme is the lack of facilitation time. Therefore, planning demonstration becomes a lecture and leave model instead of a more granular approach, where students and staff sit and break down a project together. The lack of time is a product of the problem and the problem is a product of management and process. It can also be a product of design. In a perfect world, hours could be spent between small teams and facilitators, in the development of an adequate methodology and understanding of the planning of each project. However in the hierarchy of desirable inputs and outputs, how to manage comes with the burden of what to manage, who is for, when is it for and most often forgotten by all involved, what is the point. There are a huge number of free and powerful tools for managing projects, Asana, Trello, Todoist or Wunderlist are popular. Each of which come with a very small learning curve in order to get the most out of them. However these products have the same millennial problem as email. If it is off the habit trail it will require repetition and routine to acquire sufficient mastery to extract value. Therefor students like to communicate in dedicated Facebook groups sharing thoughts, images, questions and feedback. Unfamiliar with projects of a larger scope, this process leads initial feelings of gratification through population closely followed by unbelievable levels of stress. Posts get lost in the waterfall, comments lose their context and nobody can find what they are looking for efficiently. The pervasive and invasive nature of Facebook leaves students unable to focus due to constant interruptions, distracting each teammate from the work at hand and giving them a greater sense of falling behind, being overwhelmed and increasingly insecure. This insecurity is compounded by an induced inability to make simple decisions, deferring the simplest of choices to the team in-turn, increasing the team's communication traffic and cognitive load. Scenario One: Someone snaps. The team feeling a great sense of empathy and responsibility jumps in to fill the gap. Not working within an appropriate project management system leaves the team at a loss as to what exactly the person was working on or what was actually done. Scenario Two: Tensions within the team lead to infighting and a breakdown of communication begins. Visions separate and egos get trampled. Team members may begin to feel disenfranchised and work away from the team. Missing meetings and vital communications around technical issues where their input may be critical. As this progresses, grievances escalate eventually requiring intervention. Scenario Three: Passive team members are unable to keep up with the constant stream of communication. And/Or has had a communication or comment ignored. Shoulders shrug, frustration leads perhaps to a feeling of why bother or just a sense of being ignored or left out. "Well someone knows what's going on... I'll just sit here and wait until someone tells me what to do". When things appear hard or get difficult familiarity beats advantage every time. It is only after experiencing the pain of failure will a group of students adopt a new management process. This runs contrary to technical skills where students display a high level of adaptability and perseverance is abundantly evident. The management of the project is not initially seen as a valuable component on a par with the technique, design or narrative. Funnily enough, similarities with this approach is also evident when it comes drawing. Planning, perspective, form structure are often skipped in favour of shading or colour, leading to adequate results which are difficult to redirect. As we graduate our first final year, the teams that have adopted the most structured models for project management have by far the most creative, ambitious and successful outcomes. Cracks appear because of process more often than artistic or technical ability. Some are unavoidable results of personal feelings about work hours and availability or maturity but almost all problems that impact a project or staff time are a direct result of ineffective planning. Inspire, Conceptualise, Refine, Evaluate, Plan & Produce. They are the original six steps for the design thinking model I've been working with for quite a few years now. A huge part of the problem in developing an understanding of design thinking or creative problem solving or whatever we want to call it, is the realisation that it is a five step model in execution and a six step model in explanation. Planning and production are intertwined in a never ending dance of compromise and promise. ASK: If a task is not clear, or more information is needed, please ask as soon as possible. Asking is always ok. Doing the wrong thing (or doing nothing) because you didn't ask is not ok.
DEBRIEF: It's not done until you reported it done. This is often just a one-sentence email to me or to the client, sometimes a "100%" mark in the task list, or a ticket closed. It is done, completed or fixed only when whoever needed it done knows about it. Throughout the process learning facilitators should be trying to create even teams. By even we mean functionally rather than structurally, acknowledging that individuals perform differently in different combinations. Good combinations are vibrant and productive. 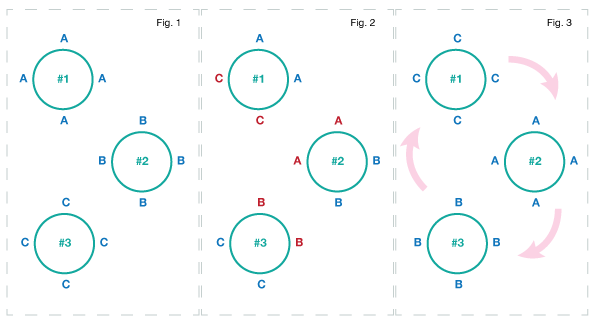 Spotting poor combinations is relatively easy, as the productivity of the team will be greatly reduced. Participants should be moved, as needed rather then waiting for a break in the process. Teams should be flat in structure, with all members being equal. Some participants will see it as their duty to take control of the situation and lead the conversation and the direction of the concepts. While this behavior might be rewarded in other settings, it does little to develop the brief or the other individuals in the team. In most cases, drawing attention to this behavior and offering guidance as to the desired structure is enough to redirect the performance of the team. For most people being asked to trust the process and defer judgment is enough, but for others the urge to question is too great. Nothing is more corrosive to the creative process than questions that narrow the thought process. Conversations should encourage divergent thinking, wild ideas and should be optimistic. There is plenty of time later for the tough questions. Teams exhibiting this behavior will require closer facilitation for a short period, until the team begins to defer judgment. “What market is there for this idea?” in isolation this seems like a perfectly reasonable question to ask of an idea/product/service. Where these type of questions become the wrong questions becomes clear when we are trying to generate a volume of ideas. In the inspire phase it is important to establish the possible market opportunities for the outcome of the brief, with opportunities being the key phrase. “Opportunities” as an adjunct to a question is like adding a firework rather then a bomb to the creative process. As we refine the leading concepts the type of questions become more focused but still leave the door wide open for change and opportunity. The questioner should always see themselves as an explorer, rather then a doubter. As the team becomes more skilled, it gains the ability to inform the doubter as to their impact on the process and suggest a redirection. Quiet, deep thinkers are great in a classroom and in a team, but too many together creates a quiet and unproductive unit. Redistributing the deep thinkers across multiple teams will improve the situation. Finding the right combination of teammates can be effortless or quite difficult depending on the group. Issues should be addressed within the group rather than pulling one person aside, quite often the group will have an alternate perspective on the situation and inform the solution. Over time each team will learn to self manage. In this model teams rotate around projects in a two-step process illustrated in the diagram above. As the teams come to a natural ebb and the facilitators feel it is time to reenergize the group, each team (fig. 1) is given 2-5 minutes to solidify their narratives. Once the time limit has been reached half of each team moves to the next project, leaving half behind to inform the next team (fig. 2). This cross over should happen quickly as to prevent any break in concentration. Each project table should now have half of the team who have been working on the project and half of the team who will be taking over the project. They are now given a few minutes (less than 5) to explain their efforts and to ask questions of each other. As soon as the time limit is reached the teams are reunited on their new project (Fig. 3). In other words each team as moved over, clockwise, one project. Again this cross over should happen quickly. Once settled each team is given a few minutes for those who have just joined the project to be briefed by those there since step two in the process. It is necessary to call time on these briefings and refocus the group to continue with the stage in the process they are at ie. Conceptualizing. Each team presents their concepts followed by a brief Q&A from all of the other participants. Presentations should be kept below a maximum of 5 minutes with Q&A also being kept to only a few minutes. Once all of the presentations are complete each team rotates clockwise one project table. Once relocated the group are give 5 minutes to discuss what they have received before refocusing and continuing with the current stage of the process. The disadvantage of this type of rotation is it takes up so much time and breaks the flow of the process. Therefore it is best reserved for switching between phases of the process ie. Transitioning from the Inspire phase to Conceptualizing. This way, presentations can be used as a tool for causing a real break in flow and as an opportunity to set the stage for the next step I the process. Clapping and cheering is an unnecessary part of the process that adds to the time taken but also ads, pressure, emotion and expectation to a process that is initially difficult enough for the participants. The group quickly gets used to no applause and presentations become much more relaxed as a result. When the time comes for final presentations and project close applause is reintroduced, marking the end of the process. More people, means more ideas. Mastering a process requires repetition; by moving the teams to a new project while still in the same phase of the process, allows them to get a better feel for what it is they are trying to achieve and how to identify the appropriate level of output and innovation. The process is designed around the personal journey of the individual participant. Part of this personal development is the recognition of the individual’s contribution to their team. Secondary to this is the relationship between teams. As a healthy competitiveness develops between teams, it is vital to the advancement of the individual that they see how each team is interdependent and builds on the contribution of the other teams. As each project develops through each stage of the process each team will loose energy as they run out of ideas. Until each individual learns to push through this wall and develop fresher more innovative ideas, it is important to build confidence and avoid disheartenment. Observing the energy levels within the group will inform as to when the right time to switch is. Team rotation also offers a unique opportunity to develop key skills in the participant. As one team passes off their concepts to the next team, each person quickly realizes after a few exchanges that clear communication is vital to the survival of their ideas. Only ideas with a strong, easily repeatable narrative develop past a couple of rotations. Participants also quickly learn another key communication skill and that is to ask the appropriate questions of the team whose work they are going to be taking over. Not asking the right questions makes building on the work of others much more difficult and lowers productivity. This continuous development of narrative and questioning, builds on both the confidence of the participant but also on their knowledge of the subject area. Individuals learn that their teammates will have answers to their questions as well as questions of their own. The development of these skills makes a marked difference in the more formal presentations, which are far more mature than those of equivalent students engaging in other methods of delivery. Failure to engage in timely rotations represents a lost opportunity for key skill development and will have a very negative impact on the overall performance of the group. As the team spends to long in each key stage, they will become demoralized as they run out of ways of generating new ideas. A disillusioned team requires a disproportionate amount of facilitation to get back on track and the negativity can spread rapidly. To short a time and they will be unable to experience the feeling of running out of ideas, which is hugely important to the process.